Frackers rule! The House of Saud may want to stabilize Brent Oil above $60 or $70 a barrel, but OPEC and Russia no longer control prices and haven’t since the 2015 energy recession. Every time OPEC cuts production they essentially transfer that lost output as a gift to the US. Despite our long-term expectation for US supplies to keep rising (11.6 mbd today), we were actually quite bullish on price since early 2016 and through 2018 when we advised buying all dips into the summer. Knowing Trump would keep threatening Iran and eventually curtail their production in a growing demand environment, it was an easy call for higher Crude prices above $70. Once we entered the seasonal downturn in October with the Iranian news already discounted, it became increasingly clear that Saudi attempts to limit new supply gluts would fail and once again provide easy money, usurping lost Saudi output for US producers. With fracking technology, OPEC will remain in a no-win situation. If they pump more oil to drive our frackers out of business, they will hurt themselves as our frackers can produce more cheaply. If they restrict supply to drive up the price then the US will simply fill the void and take advantage of artificially higher prices. Today the US produces so much oil that we can’t build the pipelines fast enough to bring the Oil and Gas to market. It costs $20 a barrel to ship Oil out of the Permian by Truck, $10 a barrel by Train and just $4 a barrel by pipeline. 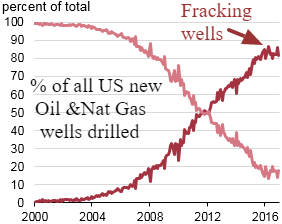 Pipelines will be unable to handle production until late 2019 to late 2020, thus we are witnessing an 80% jump in uncompleted wells as drillers hold off fracking until the supply logistics normalize in perhaps 2020. Wages are also 30% higher in the Permian as they operate above 100% capacity and are choosing to send rigs to other less active states where pipelines have the capacity. With the global economy slowing and petroleum inventories rising, it’s logical that Oil should correct into the January – February seasonal lows. Anything under $40 will be an overshoot and begin to temporarily curtail US output as prices find a floor in a slowing economy. When Managed Money (chart below) positions fall to net long holdings of between zero and 80,000 contracts we will be looking closely for a potential longer-term low. Politics will also be a major factor as any confirmation of a US and China Trade Agreement will quickly put a longer-term floor in the market and ignite a rally. Mid $40s has been our forecast for Oil with a maximum in the upper $30s.